Research the breed. Please see our links page and Dalmatian facts page and other resources on the Internet. Even if you have experience with Dalmatians, you may want to read up on rescued dogs in general. Fill out the adoption application. From this we learn about your family, other pets you currently have or have had in the past, and your plans for a new pet. This is reviewed by Rockyspot board members. After your application is reviewed, a home check will be scheduled. This is another way of checking to see if you and the dog will be compatible. The home visit will be conducted by one or two members of RockySpot Rescue, or a member of another rescue group if you are out of our area. We will want to meet you and your family members, as well as your current pets. After the home visit, all your information is then reviewed again by our board of directors. If everything looks good, you will be approved! After you have been approved and selected a dog, there is an adoption contract and an adoption donation between $150.00 and $200.00 for adoptions in the state of Oklahoma and $250.00 for out of state adoptions. 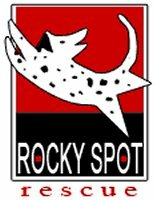 The contract is very basic; one thing it does specify is that if for ANY reason you and your Dalmatian do not work out, you MUST return the dog to RockySpot Rescue or notify us of the family who wants to adopt and they will go through our process. Each dog we take in is fully vetted, spayed or neutered, fed,micro-chipped, housed, transported, etc. This is very costly, and usually this adoption fee doesn't even cover what we spend on the dog. Charging an adoption fee HELPS us give our rescue Dals quality care. You will also receive all vet records on your new companion at the time of the adoption. Every dog that we place will go to the best suitable home. We do not work on a first come, first serve basis. We evaluate every application and do what is better for that particular dog. If a dog is returned to us for any reason after your two week trial period, your adoption fee will not be refunded, so make your selection very carefully. Remember owning a dog can be a 15 year commitment. Make sure that you and everyone in your family are willing to make such a commitment. We have in certain circumstances put a different dog in your home and no extra cost to you. When you adopt from us, you adopt us. We reserve the right to visit, call, or e-mail you concerning the well being of your new Dalmatian. We want to ensure that they are given the same level of care that our rescue had given them. Please feel free to contact us at any time with questions and concerns. We consider you family. If you are looking for a particular age, gender, etc. please submit an application. If you are not 100% committed to adopting at this time, please DO NOT submit an application. If you are from out of our local area please do not submit an application if you are not prepared to wait until vet check, home check and references can be checked out and transport can be set up. Fill out our application On-Line. You must answer every question on the application for your application to be considered. After you are approved then fill out the Adoption Contract Please print the contract and bring it to the adoption.